TWO PILOTS HAVE been arrested in Scotland on suspicion of being under the influence of alcohol as they prepared to fly a passenger plane to the United States. The two men were detained at Glasgow Airport yesterday before they were due to fly to Newark in New Jersey. 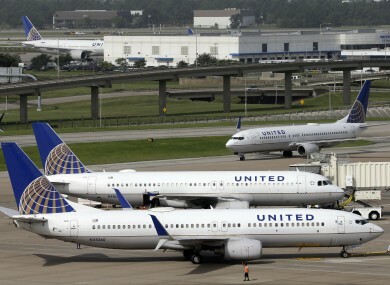 Concerns were reportedly raised over the pair ahead of the 8am UA162 flight. The service, carrying 141 passengers, eventually flew with a new crew later yesterday. “Two men aged 35 and 45 have been arrested and are presently detained in police custody in connection with alleged offences under the Railways and Transport Safety Act 2003, Section 93,” a Police Scotland spokesman said today. In a statement, a United Airlines spokesperson said: “The two pilots have been removed from service and their flying duties. We are co-operating with the authorities and will conduct our own investigation as well. The safety of our customers and crew is our highest priority. The men are expected to appear at Paisley Sheriff Court on the edge of Glasgow tomorrow. The arrests come after two Canadian pilots were charged with being drunk as they prepared to fly from Glasgow to Toronto last month. Jean-Francois Perreault, 39, and Imran Zafar Syed, 37, were arrested on July 18 as they were due to pilot an Airbus A310 plane, which carries up to 250 passengers, for Canada’s Air Transat. Perreault, from Ontario, and Syed, from Toronto, are charged under laws covering alcohol and drug limits in aviation. They also face charges of threatening or abusive behaviour. The pilots have been released from custody on bail last month. Email “Pilots arrested in Glasgow on suspicion of being under the influence of alcohol ”. Feedback on “Pilots arrested in Glasgow on suspicion of being under the influence of alcohol ”.